" British sound engineer Gilderoy (Toby Jones) arrives at the Berberian film studio in Italy to work on what he believes is a film about horses. During a surreal meeting with Francesco, the film's producer, Gilderoy is shocked to find the film is actually an Italian 'giallo' film, The Equestrian Vortex. He nonetheless begins work in the studio, at one point made to do Foley work, using vegetables to create sound effects for the film's increasingly gory torture sequences, and mixing voiceovers from session artists, Silvia and Claudia, into the score.
" 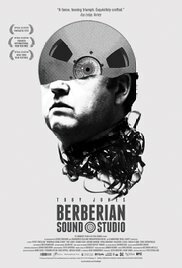 Sound is a sacrament in the Berberian Sound Studio: it enters innocuously through the ears before transubstantiating into something more sinister. That might be the most straightforward way of describing what happens in this thrillingly unstraightforward film from the English director Peter Strickland about the odd goings-on in a fusty Italian post-production suite. Note: If the main gates are closed (usually after 8pm) then entrance to the library will be through the disabled access door.